It's not easy being a young vampire who isn't allowed to hunt. All you can do is eat candy and wait for the day you're allowed out to prowl. When Harold loses his teeth due to his snacking habit, he runs away in shame and into the clutches of the last witch, who has plans for Harold's parents that will change everything. With only a few bats and a talking toad for allies, Harold's life may very well be turned upside down! While I love me some really dark horror with plenty of blood and gore, I also appreciate that there need to be books for the young horror fan in your life. You can't give a six year old something like Night of 1,000 Wolves (unless you plan to deal with the nightmares) but when they see skeletons and want to read scary stories, there need to be books ready for them to grab, read, and enjoy. 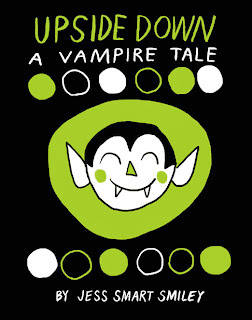 Upside Down A Vampire Tale is just such a book. The characters are very family-friendly and the story centers around a young vampire, whose struggles with fitting in will easily connect with young readers. There's some violence, but it's downplayed. Characters do die, but not in violent ways. (For example, a coven of witches, the evil characters in the story, are melted, Wizard of Oz style.) The language is extremely basic as well, making it a story that can be read on its own, if the child wishes to do so. The downside to this is that it's definitely a story more geared to younger readers. That's okay, but it was a bit disappointing to me. I've gotten spoiled by all-ages books that have a wider appeal, like Cartozia. This one is more like a comic written for children, then a comic children can read alongside their parents. However, as a book for kids, it's just about perfect. The plot moves quickly and the jokes (such as pooping on the heads of people or scaring folks doing laundry) should appeal to the target audience. There's a clear sense of good and evil, and we get a happy ending when Harold is reunited with his parents, who reward him for who he *is* not who he expects them to be. Some of the concepts are just silly fun, too, such as vampire toads or the idea that vampires like to live in pianos. Jess Smart Smiley's art style also fits in well with the idea of being a book designed for children. He's very free-flowing and abstract, with the figures looking simple but holding to an internal consistency that shows there's skill behind the sketchy lines. The characters are very emotive, moving across the page and being as active as possible. Even the bats stretch and move about to indicate their emotions. Colored in shades of green and black, the book *feels* like something from Halloween. 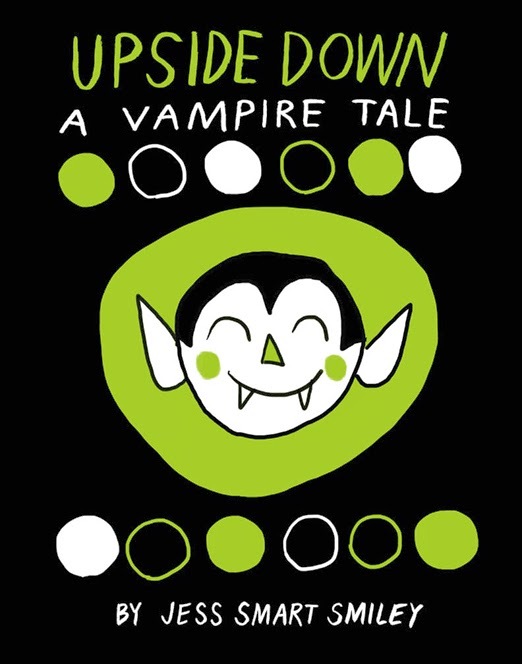 Upside Down A Vampire Tale isn't a book for anyone without kids, but if you have a young loved one ready to start down the path of horror--and don't want to keep them from their inevitable doom!--then this book is just right for them. It's a great book for the right age group, with a fun story and good characters--just the thing to cut their horror teeth on.